For the 1982 French film, see Le Beau Mariage. A Good Marriage is a 2014 American psychological thriller film based on the novella of the same name by Stephen King, from the 2010 collection Full Dark, No Stars. It stars Joan Allen, Anthony LaPaglia, Kristen Connolly and Stephen Lang. It was released on October 3, 2014. After 25 happy years of marriage, Darcy (Joan Allen) discovers her husband's sinister secret and must take drastic measures to keep it from being exposed in order to protect her grown children. 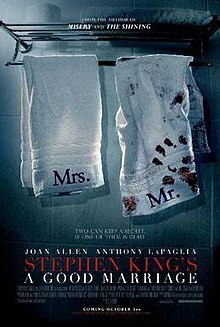 On May 19, 2012, ScreenDaily reported that Will Battersby and Peter Askin were producing an adaptation of A Good Marriage; Askin was announced as directing Stephen King's screenplay of his own novella. On September 11, 2012, Joan Allen was announced as the lead in the film. The film was released in the United States on October 3, 2014. The film, when announced, caused controversy when King said that he took influence from serial killer Dennis Rader. Kerri Rawson, Rader's daughter, said that King was exploiting her father's victims by taking inspiration from his life. Rotten Tomatoes, a review aggregator, reports that 35% of 20 surveyed critics gave the film a positive review; the average rating was 4.8/10. Metacritic rated it 43/100 based on eight reviews. Frank Scheck of The Hollywood Reporter called it "a decidedly minor" adaptation that "fails to fulfill the potential of its provocative premise". Andy Webster of The New York Times called it a "low-key, assured thriller" with a strong performance from Allen. Gary Goldstein of the Los Angeles Times called it "a wry, old-fashioned game of cat and mouse" with good acting. Pete Vonder Haar of The Village Voice wrote that it is a serviceable, nondescript thriller that was a surprising choice to adapt to film. Rod Pocowatchit of The Wichita Eagle rejected concerns of exploitation, but said that the film comes across as a low-budget made-for-TV film. Kiva Reardon of The A.V. Club rated it D+ and wrote, "By its conclusion, A Good Marriage doesn’t give a definitive answer to its titular topic, but it does make clear what makes a bad movie." Chuck Bowen of Slant Magazine rated it 2/4 stars and wrote, "The film is watchable in a plodding one-thing-after-another sort of way, but it could have used far more of King's mordant humor". Patrick Cooper of Bloody Disgusting rated it 1/5 stars and called it the worst King adaptation yet due to its lack of thrills. Staci Layne Wilson of Dread Central rated it 3/5 stars and questioned the choice of source material. Wilson said that the actors are good, but they have no chemistry, which makes the film stale. ^ McNary, Dave (2014-06-09). "Stephen King's 'A Good Marriage' Scares Up U.S. Distribution". Variety. ^ Wiseman, Andreas (19 May 2012). "Atlas bears Stephen King thriller A Good Marriage". Screendaily. Retrieved 2013-12-17. ^ Kit, Borys (9 November 2012). "Joan Allen Closes Deal to Star in Stephen King Adaptation 'A Good Marriage'". The Hollywood Reporter. Retrieved 2013-12-17. ^ Wenzl, Roy (2014-09-27). "BTK's daughter: Stephen King 'exploiting my father's 10 victims and their families' with movie". The Wichita Eagle. Retrieved 2015-02-19. ^ "Stephen King's A Good Marriage (2014)". Rotten Tomatoes. Retrieved 2015-02-19. ^ "Stephen King's A Good Marriage". Metacritic. Retrieved 2015-02-19. ^ Scheck, Frank (2014-10-22). "'Stephen King's A Good Marriage': Film Review". The Hollywood Reporter. Retrieved 2015-02-19. ^ Webster, Andy (2014-10-02). "Till Death Do Us Part". The New York Times. Retrieved 2015-02-19. ^ Goldstein, Gary (2014-10-02). "Review 'A Good Marriage' a wry, old-fashioned game of cat and mouse". Los Angeles Times. Retrieved 2015-02-19. ^ Haar, Peter Vonder (2014-10-01). "Finding Out Your Husband is a Serial Killer in Stephen King's A Good Marriage". The Village Voice. Retrieved 2015-02-19. ^ Pocowatchit, Rod (2014-10-10). "Movie review: Stephen King's 'A Good Marriage' a mediocre thriller". The Wichita Eagle. Retrieved 2015-02-19. ^ Reardon, Kiva (2014-10-02). "Stephen King adapts a bad movie out of his own A Good Marriage". The A.V. Club. Retrieved 2015-02-19. ^ Bowen, Chuck (2014-09-28). "Stephen King's A Good Marriage". Slant Magazine. Retrieved 2015-02-19. ^ Cooper, Patrick (2014-10-03). "[Review] 'A Good Marriage' Is the Worst Stephen King Movie Yet". Bloody Disgusting. Retrieved 2015-02-19. ^ Wilsn, Staci Layne (2014-09-29). "Stephen King's A Good Marriage (2014)". Dread Central. Retrieved 2015-02-19.